Preview a chapter from Oma The Faithful Daughter! This is a picture story book in the folktale genre of a young girl who in order to prevent her mother from dying from a poisonous snake bite, went on an intriguing long journey to get the snake's antidote. Her devotion and courage were rewarded! This is a picture story book in the folktale genre of a young girl who in order to prevent her mother from dying from a poisonous snake bite, went on an intriguing long journey to get the snake's antidote. Her devotion and courage were rewarded! There are currently no appearances scheduled. Authorsigning at Barnes and Nobles Palmdale! 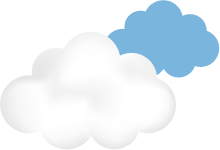 Thursday December 14, 2017 from 5 - 7 pm! Saturday October 1, 2016 5 p.m. BOOKSIGNING! STORYTELLING! ARTS & CRAFTS! At OZED Community Event. March 13, 2008 8:00 a.m. to 1:00 p.m.
Sunday February 24, 2008 2:00 p.m.
3400 W. Arbor Vitae St.
June 30, 2007 10 a.m. to 5 p.m.
BOOKSIGNING! STORYTELLING! ARTS & CRAFTS! May 24, 2007 at 3:30 p.m.
Saturday April 28, 2007 10 a.m. to 6 p.m. Sunday April 29, 2007 10 a.m. to 5 p.m.
April 20, 2007 at 12: 36 p.m.
July 8, 2006 at 7:30 p.m.
Saturday June 3, 2006 from 10:00a.m. to 5:00 p.m.
BOOKSIGNING & STORYTELLING! ARTS & CRAFTS! June 2, 2006 at 11 a.m.
Saturday April 29, 2006 -10 a.m. to 6 p.m. and Sunday April 30, 2006 -10 a.m. to 5 p.m.
February 25, 2006 11 a.m. to 3 p.m.
Sunday October 23, 2005 2:00 p.m. to 6:00 p.m.
Saturday June 11, 2005 10:00 a.m. - 4:00 p.m. This book is rich in narrative folkloric embedded messages of cherised African tradition and values which are kindness, humility,love of one's family, self-sacrifice, doggedness and sincerity. I read it to my 5 year old daughter and she henceforth makes me read it to her every night. The book is colorful and gives the reader a beautiful pictorial imagination of the story setting in Motherland Nigeria-Africa. Nobel laureate Professor Wole Soyinka, Cyprian Ekwensi and Chinua Achebe will be proud of the writer Dr Ogo Okoye-Johnson for putting out this beautiful folklore into a children's literature. It is highly recommended not only for readership among African Americans and Africans in diasporia but to other races who desire to learn and know about Africa and African culture. Please get your own copy today because I won't loan you mine, o.k ! I own this book! I recommend it for all children. It teaches great and universal moral lessons! It is especially great for African American History Month. As a Hispanic, I found the book to have similar values found in my culture. Every family should own a copy of the book! It is a good read with beautiful illustrations! What are you waiting for? Get one today! In Oma:The Faithful Daughter, Dr. Ogo Okoye-Johnson successfully addresses the timeless theme of a good heart and good works triumphing over the evils and misfortunes of life while captivating the reader with the sights and sounds that are an African village. Oma, the heroine, in spite of experiencing and adapting to the loss of wealth, social position, and a father's affection is able to summon the strength to meet and overcome the circumstances created by a life-threatening snake bite to her mother while capturing the heart of a prince. 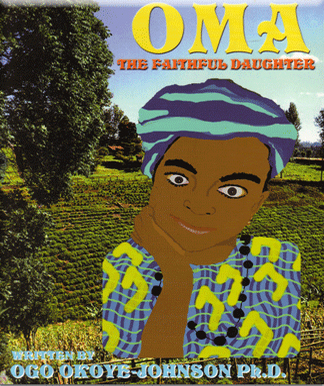 Although written and beautifully illustrated to inspire the imagination and attention of children, Oma: The Faithful Daughter serves as a testament to the indomitable human spirit for all age groups. I read this book to my children and they were enthralled by the story. My daughter's comment was Mom, Oma's story sounds just like Cinderella's story. My six year old now picks it up and reads it to her younger siblings. This book's colorful illustration would appeal to children of all ages and the message comes through loud and clear.Little ones will savor the story and follow Oma's journey to the happy ending. An intriguing book that every home should have! Dr. Ogo Okoye-Johnson as a seasoned and avid multicultural practitioner recognizes the essential relationship between the cultural background of students and their academic success. Her years of research on multicultural education and her practical experience in the field of education as a teacher and as an administrator bolster her belief in the importance of multiculturalism in the schools and in the larger society. a feature-length animated movie is under production! © 2019 All Rights Reserved. 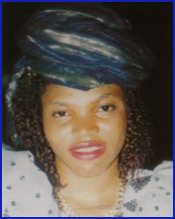 Oma The Faithful Daughter by Dr. Ogo Okoye-Johnson.